Washington County, Illinois, Isaac Hall probate file, Box 22, County Court; Illinois State Archives, Springfield. Fortunately, there are other resources that provide clues as to who at least some of the other children of Isaac Hall may have been. Among them is the 1850 U.S. census for District 20, Washington County, Illinois, which counts three Hall households in a row. In the first lived Elathan Hall, thirty-seven, a farmer from Tennessee.3 In the second lived Isaac Hall, forty-five, also a farmer from Tennessee.4 In the third lived Jonathan Hall, fifty, a farmer who was a native of North Carolina,5 as was the only other adult male resident of the household, Isaac Hall, seventy-four.6 Although relationships between members of a household were not recorded in the 1850 census, based on the information provided, it seems logical to assume that the senior Isaac was Jonathan’s father, and that they were, in fact, the same Isaac and Jonathan of the aforementioned probate record. Their living arrangement suggests why Isaac may have felt so indebted to his eldest son when it came time to pen his will. Perhaps he had spent many years in the care of his son’s family. And what of the younger Isaac Hall and Elathan Hall who lived next door, or, rather, on neighboring farms? No, they had not been born in North Carolina – but Tennessee falls between North Carolina and southern Illinois, making it a likely stop for a family that may have gradually migrated west. The thirteen-year age span between Jonathan, the younger Isaac, and Elithan suggests a possible sibling relationship. An exploration of additional records indicates that these families were closely linked for decades. This is a perfect example of the importance of Cluster Research, also called the FAN Principle – an awareness of an ancestor’s Friends, Associates, and Neighbors – explored by Elizabeth Shown Mills.7 I should note that my dad stressed the importance of this principle to me in my research long before we knew that it had a name! How have you used the FAN Principle in your research? 1 Washington County, Illinois, Isaac Hall probate file, Box 22, County Court; Illinois State Archives, Springfield. 2 Washington County, Illinois, Isaac Hall probate file, Box 22, County Court. 3 1850 U.S. census, Washington County, Illinois, population schedule, District 20, p. 123 (stamped), dwelling 149, family 349, Elathan Hall; digital image, Ancestry.com (http://www.ancestry.com : accessed 4 March 2014), citing National Archives microfilm M432, roll 732. Elathan Hall has also been spelled as Elithan Hall. 4 1850 U.S. census, Washington County, Illinois, population schedule, District 20, p. 123 (stamped), dwelling 150, family 350, Isaac Hall; digital image, Ancestry.com (http://www.ancestry.com : accessed 4 March 2014), citing National Archives microfilm M432, roll 732. 5 1850 U.S. census, Washington County, Illinois, population schedule, District 20, p. 123 (stamped), dwelling 151, family 351, Jonathan Hall; digital image, Ancestry.com (http://www.ancestry.com : accessed 4 March 2014), citing National Archives microfilm M432, roll 732. 6 1850 U.S. census, Washington County, Illinois, population schedule, District 20, p. 124 (stamped), dwelling 151, family 351, Isaac Hall; digital image, Ancestry.com (http://www.ancestry.com : accessed 4 March 2014), citing National Archives microfilm M432, roll 732. 7 Elizabeth Shown Mills, “QuickLesson 11: Identity Problems & the FAN Principle,” Evidence Explained: Historical Analysis, Citation & Source Usage (http://www.evidenceexplained.com/content/quicklesson-11-identity-problems-fan-principle : accessed 4 March 2014). 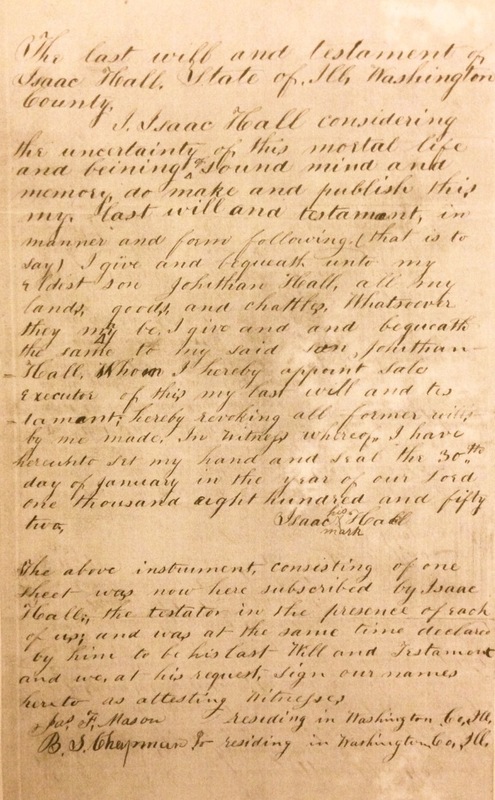 This entry was posted in Uncategorized and tagged 1850s, family history, genealogy, Hall, Illinois, North Carolina, Tennessee on March 5, 2014 by Melanie Frick.